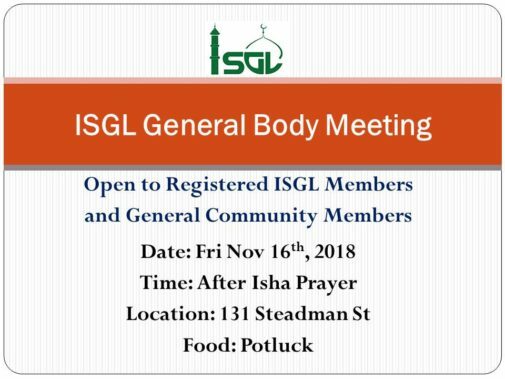 The Board of Directors of the Islamic Society of Greater Lowell has scheduled a General Body Meeting to be held on Friday November 16th 2018 after Isha prayers at ISGL. The topic of the GBM will be for the ISGL board to present the details of the recent sale of the existing ISGL property at 131 Steadman Street and also to present the details on the plan and requirements to move to the new location at 5 courthouse lane. The registered members of ISGL and the community members, in general, are invited to attend this important upcoming GBM.